We added the Sunday 1/2 Marathon in 2016 since Saturdays 1/2 Marathon fills up very early. Please note that all Saturdays races will likely fill up by mid-June. There will be NO WAITLIST (we'll over-sell to account for no-shows), so sign up early! We expect Sundays 1/2 Marathon to be open until 1st of November (and Sunday's entry fee is considerable less!). *Sunday's 1/2 Marathon will also start at 8 AM, but the waves will only be 4 min. apart. Note that daylight savings change is the night before, clocks "fall back" one hour. Participants will be assessed a 30 minute penalty for not starting in their assigned wave. (Not sure which wave to choose? 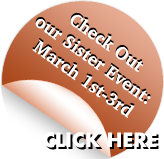 Click here for more info.) Please start in your assigned wave to allow appropriate space on the trail. 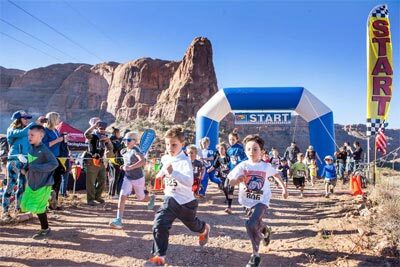 Your Registration includes an incredible course (fully marked), Chip Timing, t-shirt, aid stations on course with water and snacks, post event soup and snacks, a finishers medal, Sponsor "swag" to top 3 M/F overall in each race, trophies to top age group finishers (10 year age-group increments, M/F) in the marathon and half marathon, $4,800 cash purse shared between top Marathon Finishers, a chance to be titled the “Trail Marathon National Champion” (overall and age group). A portion of your entry fee will be donated to local non-profit organizations, including Friends for Wheelin' and Community Rebuilds. Note that Saturday's races have filled by mid-June the last 4 years. *Note that all Saturday events have filled up by mid-June the last 4 years. Click here for Refund and Transfer policies. 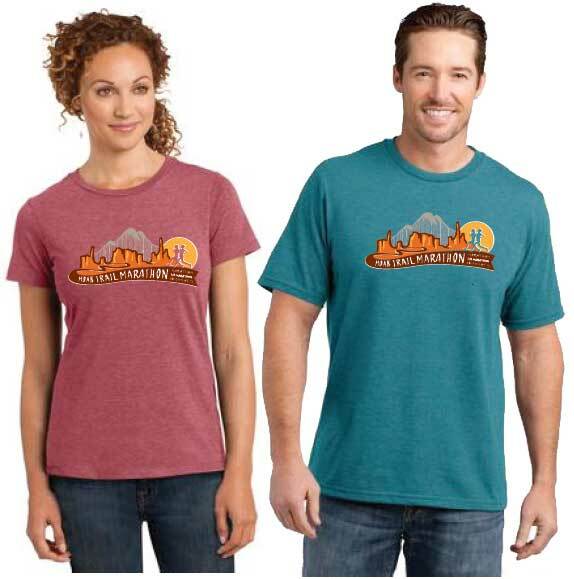 Packet Pick-Up: Will be at the race venue at Kane Creek parking lot on Friday, November 1st from 3:30-6:30 pm or on Saturday November 2nd, 2019 starting at 6:30 am. Sunday's Half Marathoners may also pick up their packets Sunday morning starting at 6:45 am. 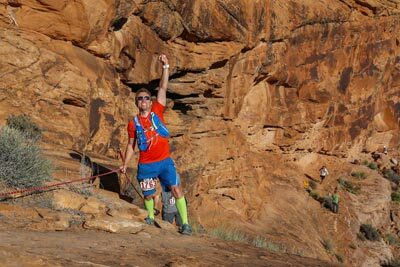 Directions to Race Venue/Start/Finish: Heading South on Main Street Moab, turn right on Kane Creek Road which is between the Mc. Donald’s and the Burger King. Continue about 4 miles, staying left at the one fork. You’ll follow the Colorado River until the road turns from pavement to dirt. Park in the signed lots on the right. 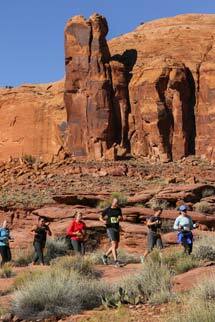 Marathon: Set a PR for your WOW factor on this course! This course is unique and wild. 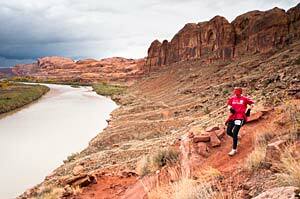 The canyons around Moab are unlike anywhere in the world, and this course conquers some of the most spectacular! You will travel through narrow canyons with spectacular vertical walls on both sides and along the rim-tops of deep canyons with spectacular vistas every direction. 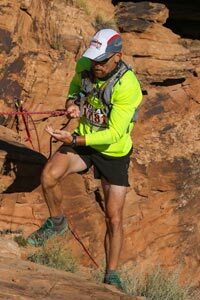 The terrain changes frequently to keep the miles clicking and includes narrow single-track, rugged jeep trails, sandy washes, ‘Moab-style slickrock’, a short section of dirt road, a few sections of no-track, a very old mining trail and a couple sections of fixed line traverse. Views will take your breath away, and include the spectacular red rocks of “Behind the Rocks Wilderness” and “Amasa Back” area, also view the sheer vertical walls of Pritchett, Hunter and Kane Creek Canyons and views into Canyonlands National Park. In the distance are the beautiful 12,000 foot La Sal Mountains. 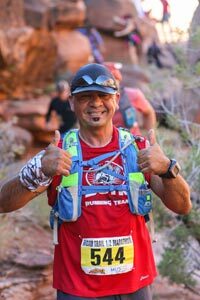 You’ll pass by several arches, lots of lizards, some really cool and funny looking rocks, possible eagles and hawks, some neat ancient pictographs, a couple small creeks and springs, and our friendly aid station volunteers who will be there to hydrate and fuel you in some of the craziest spots! The elevation gain and loss is about 3500 ft. There are two major climbs, one at the beginning which is nice and gradual, and one just after the ½ way point which is shorter and steeper. There are several other short climbs and descents throughout the course. 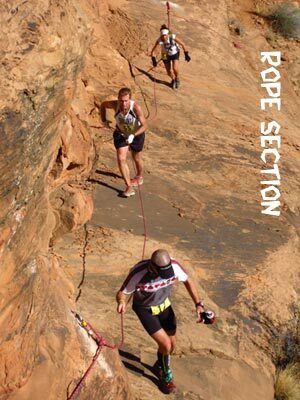 The top runners will run all but the fixed rope section and are expected to finish in less than 4 hours. 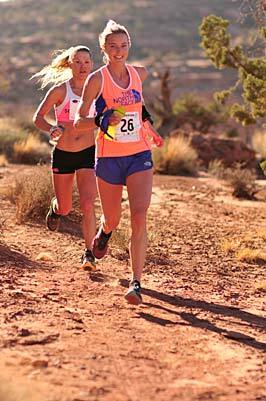 Average runners will do a combo of running with a bit of walking and are expected to finish in the 5 to 6 hr range. 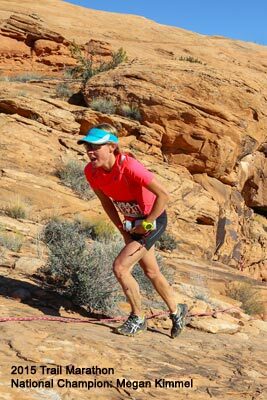 If you want to feel ecstatic and in awe after a race, then this one is for you! Click here for map and profile. 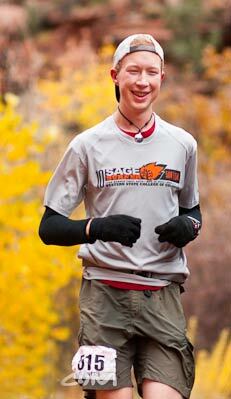 ½ Marathon: The ½ Marathon course follows the first 9 miles of the Marathon Course. Then you'll get a break, technically but not physically as you'll climb up the switchbacks of Kane Creek Road, then back down where you'll enter the depths of Kane Creek Drainage. This unique canyon is rarely travelled but absolutely beautiful. Most of the canyon is runable and along hard packed sand with a bit of water. Some sections are on single-track along the shore and other sections through deeper water (not more than knee deep, unless the Beavers go to work before the race!) 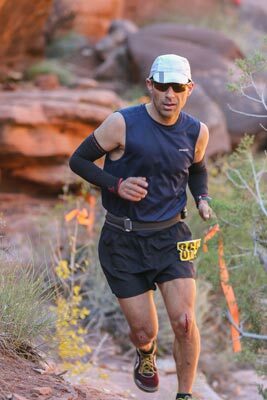 You’ll travel abouta mile through the canyon, and then along the dirt road for a ½ mile and a final 1/2 mile of fun singletrack to the finish. Click here for map and profile. 5K: Not your ordinary 5K! 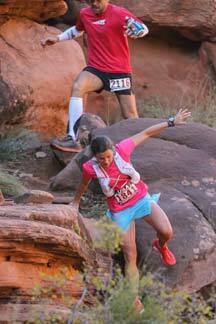 This adventure run/walk features natural and manmade obstacles including running under an arch, through a cave,use of hand-line to go up and down a small cliff, up two ladders, two creek crossings, running through a two gigantic culverts, crossing a sand pit,over a rock maze, completing an obstacle course, and other FUN and Exciting obstacles. No special skills required. Kids K: Kids love it! Parents love it! This is an adventure 1k, not your ordinary dash. There’s a gradual uphill to an arch and cave that’s the kids will run through. Then a steep technical decent to a deep drainage, then a run through the drainage to a ‘tunnel’, down a ladder, across a bridge, through the ‘jungle’ and up a short steep hill to the finish. Challenging for kids, but so much fun. Parents/guardians may join their kids. There is no fee, but they must sign waiver at check-in. Attention Runners: Two sections of the course cross private property. Please do not travel on these sections. Travel on these sections are allowed ONLY on race day for registered runners within the cutoffs. Anyone caught on these sections otherwise will be charged with trespassing. The two sections are Mile 14-16 of the Marathon, and the section between the two fixed lines which are Mile 2 of the 5k and Mile 25 of the Marathon. There will be an AWARDS TABLE set up in the finish area where eligible awards winners in all division may come to pick up your trophies and prizes and have your picture taken. 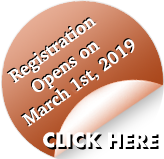 *Note that you will need to wait until results are final to pick up your awards, which will be up to 40 min after you finish to account for the difference in the wave start times. Thanks for your cooperation. 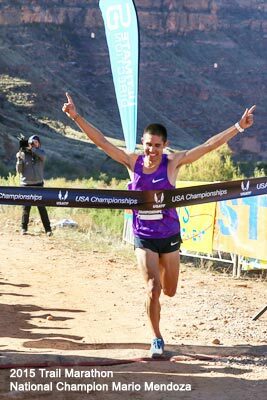 Awards ceremony for the USATF Trail Marathon Championship will be at 2:00pm at the stage next to the awards table. Prize money and USATF medals will be given out at this time. *Marathon Age Group Trophies (for all top finishers, USATF membership or not) may be picked up anytime at the awards table. Finishers' mug or medal to all finishers within the cutoff. Custom trophies made by local artist Jim Aleff to the top 3 M/F finishers in the following divisions: 19 & under, 20-29, 30-39, 40-49, 50-59, 60-69, 70+. Top 3 overall M/F finishers will get a ‘swag-bag’ filled with goodies from our sponsors! Prize MONEY! 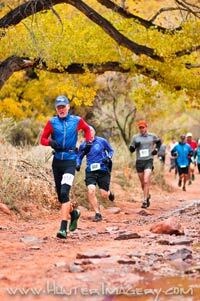 : $4800 Cash purse to top 5 M/F finishers: $700, $500, $400, $300, $200 and $300 to the top male/female masters finishers. USATF Awards Winners (to those with USATF Membership): Beautiful Championship medals to top 10 overall M/F and M/F age groups over 40 in 5-year increments. Note that prize money and USATF medals will be given according to ‘clock time’, not ‘chip time’. Trophies will be given according to chip time. Please race in the 1st wave if you are a USATF member and/or if you may finish in the top 5 overall so you may receive your money and medal! Also PLEASE get your membership! Prize bag for all kids.